No matter what types of products I use on my hair, it always end up feeling like straw on the ends from all the use of heat tools and highlighting. My hairdresser had me start using Moroccan Oil Light on the end of my hair and that has helped, but I still need a little aid. 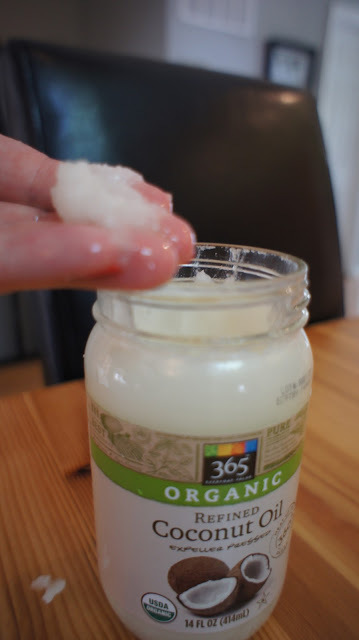 I had been reading a lot about using coconut oil on my hair, as well as many other uses. Did you know you could use that stuff to treat acne? I’ll be trying that one next. Coconut oil is not the cheapest item you are going to find in your food store. A good one can be had for about $9 and you can find it at your local food store; probably in health food section. I picked up a jar at Whole Foods so it turned out to be organic. Buying the oil allows for many uses so the price did not phase me as much. I have used it a few times now and only am about 1/3 way through the jar. The recommendation is to use the virgin coconut oil. Now don’t be surprised when you open up the bottle and realize it is not like you average EVOO (OK, I watched too much Rachel Ray) Extra Virgin Olive Oil; it looks like lard. Follow the steps below to some healthy, shiny, and gorgeous hair. Collect all your materials: Microwavable cup, hair comb, unused painting brush, shower cap or cling wrap, foil and hair tie or clip. Put on a junky t-shirt because oil on nice clothes never comes out in the laundry. Put a good cup of the oil into the microwavable bowl and heat in the microwave about 30 seconds until it looses its thick white texture. It is just the like the stuff you put on your salads now. Make sure you don’t grab it out of there too fast, especially if you put it in too long! Depending on your hair length and the amount of hair you have, you might want to separate your hair into sections. With the clean pain brush, start the tips of your hair and brush the oil up to your scalp. I brush my scalp because it needs some nourishing. Once all the oil is applied, put the shower cap on or wrap the plastic wrap around it. I also wrapped foil around to keep in the heat. I usually leave it on for an hour or so, depending on the amount of time I have. You can leave it on over night if you wish, but make sure you don’t care about your sheets or pillowcase. No matter the amount of time you keep the coconut oil on….YOU NEED TO WASH YOUR HAIR! The first time I tried this I didn’t use shampoo or conditioner and it didn’t work out. Wash it like normal after the treatment. I did this treatment a few days before I went to get my hair done and my hairstylist commented that it was in such nice condition. If you are sick of your hair feeling like straw, try this. You won’t regret it.